Holiday Village East in Mt. Laurel is a well-maintained active adult community in a semi-rural setting of Burlington County, New Jersey. This 963 home community was built by J.S. Hovnanian & Sons between 1990 and 2001. This community is ideally situated close to major highways, shopping, dining, and entertainment. Buyers can choose from carriage homes, patio homes, or condos. The maintenance fees cover access to the plentiful amenities and landscaping is cared for as well. The grounds contain stocked fishing ponds for the residents and plenty of natural spaces. The amenities include a nicely appointed clubhouse and many organized trips and events geared towards active adults over 55. Holiday Village East's residents are also active in a large variety of social clubs. Activities at Holiday Village East begin at the tastefully designed clubhouse. It features an exercise room for individual workouts or group aerobics classes. An arts and crafts room allows for creative pursuits, either individually or by participating in painting classes and crafting clubs. Residents also like to get together in the card and billiards rooms to shoot pool, play their favorite card games, or learn new ones. The computer room and library offer plenty of resources and work stations for business or pleasure. The ballroom is an ideal location for frequently scheduled parties and special dinners. Homeowners can get their exercise outside by playing tennis, or engage in friendly competition on the bocce ball and shuffleboard courts. For relaxing on those warm summer days, Holiday Village East also has an outdoor pool and patio. Holiday Village East offers detached single-family carriage homes, attached patio homes, and condos available on a resale-only basis. All homes have two bedrooms and two bathrooms. The Holiday Village East condos are situated in a park-like setting and are within walking distance to the local shopping center. All condos feature one to two bedrooms, one to two baths, full kitchens and have between 950 and 1,364 square feet of living space. Fireplaces, sunrooms and great views of the community's pool and water features make these condos very appealing. The patio homes are grouped in clusters of three to four homes and come in three different floor plans. Both have two bedrooms, two bathrooms, and eat-in kitchens. The master bedrooms have large walk-in closets and full baths. Optional features include fireplaces and family rooms with sliding doors leading to private patios. These bright and airy homes range in size from 1,282 to 1,537 square feet. Wooded areas behind many of the patio homes allow for extra privacy. J.S. Hovnanian & Sons offered eight models of the carriage homes, each available with two choices for exterior facades. The carriage homes have master suites with full baths and some have second floor lofts. Some models have two-car garages, while others have one. These beautiful houses offer between 1,200 and 1,828 square feet of living space and have the lowest home association fees. Great home values, reasonable maintenance fees, and a convenient location make this community a very desirable and popular place to live. Since lawn mowing and snow removal are included in the monthly association fees, residents have plenty of time to participate in all the activities and events at Holiday Village East. Special events take place on site all year long and include cookouts and pool parties during the warm seasons and indoor concerts as well as variety shows during fall and winter. Residents also go on casino and museum trips and take painting and computer classes. In addition, there are plenty of clubs to join that represent a broad spectrum of interests. 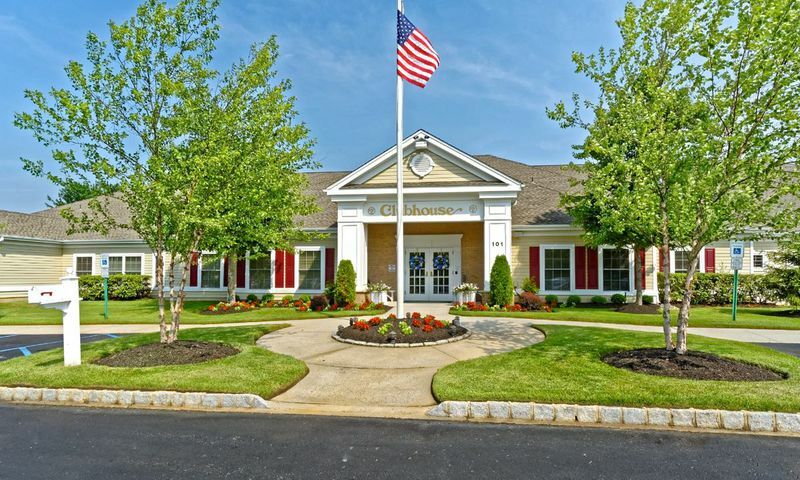 Holiday Village East is located in beautiful Burlington County, New Jersey. The community is ideally located near major roads I-295, Route 73, Route 70, and the New Jersey Turnpike. The Moorestown Mall, Cherry Hill Mall, and Center City Philadelphia shopping district are just some of the major shopping destinations within the area. Other points of interest include the Philadelphia Zoo and Camden Aquarium. New York City, Washington, Baltimore, Atlantic City, Cape May, and Ocean City are also popular destinations for day trips. it is easy to see why Holiday Village East is a popular 55+ community with so much to do in and around this beautiful neighborhood in Mt. Laurel, NJ. There are plenty of activities available in Holiday Village East. Here is a sample of some of the clubs, activities and classes offered here. There are 284 condominium units found throughout three sections of Holiday Village East. These residences offer the ultimate in low-maintenance living. Condo units feature one to two bedrooms, one to two bathrooms and lot parking. Please Note: Floor plans are not available at this time. There are 153 patio homes found throughout Holiday Village East. These homes offer 1,282 to 1,537 square feet of living space with two bedrooms, two bathrooms and a one-car garage. Please Note: Floor plans are not available at this time. There are 536 single-family homes offered within Holiday Village East. Homes range in size from 1,260 to 1.828 square feet. Homes typically feature two to three bedrooms, two to three bathrooms, and an attached one or two-car garage. Please Note: Not all floor plans are available at this time. You'll find some nice places here and the prices are reasonable. We've found the people who live here are friendly and that is what makes the neighborhood so nice. Marvelous facilities, neighborhood and location. Residents are more than friendly. Our realtor was outstanding in every way. 55places.com is not affiliated with the developer(s) or homeowners association of Holiday Village East. The information you submit is distributed to a 55places.com Partner Agent, who is a licensed real estate agent. The information regarding Holiday Village East has not been verified or approved by the developer or homeowners association. Please verify all information prior to purchasing. 55places.com is not responsible for any errors regarding the information displayed on this website.